The function may leave 1 parameters unbound (e.g. 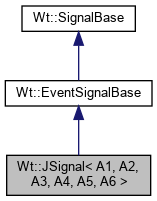 using boost::bind placeholders _1) that may be bound to the event detail object passed by the signal. Connect a slot that takes one argument. Connect a slot that takes two arguments. Connect a slot that takes three arguments. Connect a slot that takes four arguments. Connect a slot that takes five arguments. Connect a slot that takes six arguments.